"Ma," Hosh asked. "We've made so many recipes now, prepared so many different dishes, yet you still haven't taught me how to make our own staple dish, roti. Why?" "Roti requires time and effort," said Isha, "It's not as quick, or simple to make as the other dishes I've been teaching you so far." "I still want to learn it," Hosh insisted. "It doesn't look all that complicated. And it is my own traditional food, isn't it?" When he had read and assembled the ingredients, she showed him how to make them. "Add water," she gave him cooking tips as she worked swiftly, "and oil, if desired, to the Ata in a mixing bowl. Normally cold water will do." "Slowly pour in just enough water to form a soft, knead able dough. When done, it should be a little softer than play dough." "Different kind of flour needs different amount of water. Generally, two cups flour needs about one cup water." "The hindi word roti (रोटी) is said to be derived from the Sanskrit "Rotikā" (रोटिका), meaning "unleavened bread". It is traditionally made from Aata, or stoneground wholemeal flour." "Rotis made with wheat originated in the Indian subcontinent and have been eaten there for centuries." "Various types of roti are also popular in parts of South Asia, South Africa, Ethiopia, and the southern Caribbean, particularly in Trinidad and Tobago, Guyana, Suriname, and Fiji." "Naan, on the other hand, is a yeast-leavened bread. Kulcha in Indian and Pakistani cuisine is a bread-like accompaniment, made of processed flour (Maida) leavened with yeast." "Dough for all of these is turned onto a clean working surface and kneaded for about 8-10 minutes or until silky-smooth." "You can then cover the dough with an overturned bowl or a plastic wrap and leave it for 1/2 to 3 hours so that water is absorbed by the flour homogeneously." "Wet its top surface a little, so that the top doesn't dry out. This makes it easier to roll nicely edged discs from the dough. Knead the dough for about a minute again before using, for best results." "Some āta needs resting, some doesn't. So you can make roti with the latter straight away. Some has to be mixed and kept in fridge overnight. Good aata is the key to making a good roti." "I haven't got time to wait today, so I have just kneaded my dough as thoroughly as I could. I will now skip the waiting, and go straight to the next step." "Divide the dough into lime sized balls. Preheat a griddle or non-stick heavy fry pan over moderately low heat for 3-4 minutes." "Flatten a ball of dough, dredge it in flour, and roll out the ball into a thin, perfectly even, smooth disk of dough about 15 cm (6 inches) in diameter." "You can do this with a rolling pin over a rolling board, if you have these. I have seen people use ingenious devices instead. Like rolling the dough with a bottle over any flat surface, or just slapping it flat using their hands." "Roomali roti is made using just hands, but the dough needs to be oiled for that. It is a famous large yet paper thin bread popular in South Asian cuisine." "I've eaten Rumali roti before," Hosh reminisced, "It's scrumptious. Actually Scrumptilitious! Ummm..."
"Focus here," she laughed at his funny gesticulations, "Carefully pick up the Chappatti now and lightly slap it between your hands to remove the excess flour." "Slip it onto the hot plate, avoiding any wrinkles. Cook for about a minute on the first side. The top of the chappati should start to show small bubbles." "Turn the chapati over with tongs. Cook it until small brown spots appear on the underside as well. As the chapatti is already heated, this should take no more than another half a minute." "If using gas, turn a second burner on high, pick up the chapati with your tongs, and hold it about 5 cm over the flame. It will swell into a puffy balloon. This is called Fulka in Punjabi, meaning Blown up." "Continue to cook the chapati over the flame until it is specked with black flecks. Just make sure that you don't split it towards where you are holding it, as steam can quickly burn you." "Place the cooked chapattis in a bowl or basket and cover with a clean teatowel or muslin cloth." "Some people like to oil or butter their tops at this stage, or later as soon as all chappattis are cooked and stacked, but if you want to keep your fat intake down, better not oil them at any stage. Buttered rotis do taste better though and keep softer for longer. Anyway, serve chappatis hot for best results." "If you can't, or are cooking for a large feast, you can make them earlier but cover and keep them warm in a preheated oven or an airtight container. Keeping them in the preheated oven for any more than half an hour before serving will begin to dry the chapatis out, and they don't taste good dry." "Some cook rotti on a heavy based ordinary frying pan or an Iron hot plate called Tava, Ma?" Hosh asked, "Are they any better than the hotplate?" "The Iron hot plate was traditionally used," she answered, "but it is heat inefficient. Some suggest that cooking directly on Iron is still better as it allows Iron to be adsorbed on food and consumed, possibly helping counter the eater's iron deficiency. But I have not researched the matter." "If using either of these, heat the element to medium heat. Put the roti on them for about half a minute and then turn. Cook this side for another half a minute. Bubbles will form." 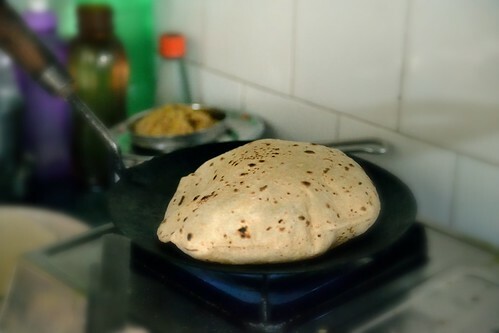 "Add pressure to the roti sides with a dry cloth or tea towel and within seconds the roti should start puffing up like a balloon." "Squash down where you are pressing and turn. Remove from the pan once the Phulka (Punjabi: ਰੋਟੀ, ਫੂਲਕਾ) puffs up. Place on a plate and brush with butter or ghee, if you wish." "Repeat the process to make other rottis and stack them on top of each other. Once the rotis are cooled, re-stack to avoid them sticking to each other."